Research in Motion Inc. (RIM) released BlackBerry Management Center (BMC) today, a free cloud-based smartphone management service that gives a taste of the capabilities found in BlackBerry Enterprise Server (BES). Targeted at small businesses, BMC allows for up to 100 BlackBerry smartphones that receive e-mail through an Internet service provider (ISP) account or Web mail to be managed by an administrator. Smartphones connected to the service can be remotely backed up, locked down, or wiped clean of data to protect sensitive business information when the need arises. Administrators will also be able to setup and troubleshoot e-mail accounts for users, and locate a misplaced BlackBerry by triggering a loud ring and displaying a message on the home screen. RIM found that millions of its users were using BlackBerry Internet Service (BIS) e-mail accounts for both personal and business e-mail, says Pete Devenyi, senior vice-president of email and management platforms at the BlackBerry maker. So it created a service to allow an administrator to manage employee BlackBerrys in one place. The protect options available in BlackBerry Management Console. 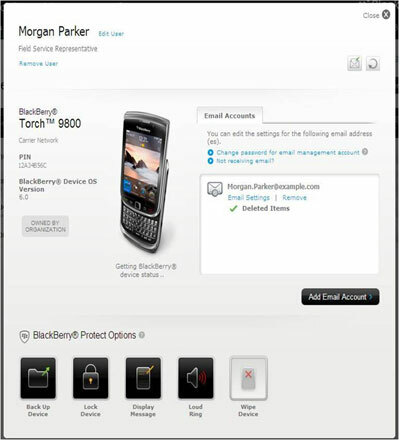 The management console combines previously existing RIM services BlackBerry Protect and e-mail account management, available to individual users, and exposes them to an administrator control. Many BlackBerry users don’t take advantage of these features on their own, Devenyi says. The free service should appeal to small businesses, according to Krista Napier, senior analyst of emerging technology at IDC Canada. Administrators add BlackBerry devices to the management console by sending out invitations to employees. Employees then have the option to accept or decline, and define what level of access they give to their device. Information such as the BlackBerry model, PIN, OS version, and e-mail accounts are displayed. Devices can be backed up to the cloud on a timed schedule with automated daily, weekly or monthly options. BMC is an alternative to RIM’s BES Express product, an on-premises box for mid-sized companies. The management console is compatible with BlackBerry devices running OS 4.6 and above. IBM 5150: Can this 30-year-old PC still get work done?